Know your score – High credit qualifies you for lower interest rates, so having good credit ends up saving you a lot of money in the long run. Find out what your score is from a major credit bureau. Never pay late – It's best to pay your bills as soon as you get them. You don't want to risk a late payment. If you can't pay them off in full, make sure you pay off the minimum balance. Frequent late payments will screw your credit score. Be responsible – Establishing good credit boils down to taking responsibility for your bills. Keep your credit card balances below 35% of the total credit available, and always pay your bills in full on the same day you get them in the mail if you can. Be proactive – If you have a small source of income, do everything you can to give yourself an edge: ask companies to change the due-dates for payments, pay all your bills online, and contact a credit counselor who can help you review your finances. When it hits the Fan – Exhaust all the options available to you and DON'T RUN UP MORE DEBT. Apply for more credit cards with lower interest rates and opt for debt consolidation. You don't want to resort to debt management, or worse, bankruptcy. that you are going to be paying for over a long period of time (i.e., rent on an apartment). Having good credit means you can be trusted, giving you a serious leg up when you need to buy anything big, like a house or a car or a gilt foosball table. Bad credit makes you the lepers of the lending community; they will keep away from you at all costs and charge serious fees just for shaking your hand. Fortunately, there are a number of pretty easy things to do not only to build credit from the start, but also to fix it if it gets bad. It’s important to know how credit scores work. High credit scores qualify you for lower interest rates. The interest rate is the amount of money that a credit card company or bank will charge to lend you money. Therefore, keeping those rates as low as possible will save you a ton of cash. Landlords (for pretty obvious reasons) love high credit scores and may very well use that as a determinant when choosing between potential candidates. The three major credit bureaus, TransUnion, Equifax, and Experian, determine your credit scores. You are entitled to one free copy of your credit report from these bureaus, as well as advice on how to check it for errors and signs of fraud. A good score is between 700 and 750. Basically any bill (be it rent, utility, credit card, medical, car loan, student loan) that you wait too long to pay can affect your credit. Too long is pretty subjective and it depends on the bill. Credit card companies will usually give a "grace period" of up to a month after the due date, medical bills often more. Nonetheless, if you ever test their patience and let it get to that stage, you’re screwed. Your credit score will go down and your lenders will start thinking you’re a shaky bet. In response, they’ll raise their interest rates as well as your minimum payments, making it impossible for you to pay them off, thereby leading to more late payments and higher interest rates and finally death by petty borrowing. Annoyingly, there are a lot of activities that hurt your credit score for no apparent reason, like comparison shopping for student loans, signing up for a bunch of store credit cards, or canceling credit cards (available credit is another big factor in credit scoring, so the more available credit overall, the better). Be extra vigilant when making decisions related to loans and credit cards. There are many ways to establish credit, but whole process boils down to taking responsibility for bills. Starting before you leave school will give you a jump start: Sign up for that on-campus promotional credit card. Get that off-campus apartment utility bill put in your name. Just make sure you pay all of it ON TIME and IN FULL. It’s never too early to start, unless you literally have no money. The easiest way to establish credit is with a credit card, and you won’t have to look very hard to find one. Credit card companies specifically target college students because they’re betting your lack of experience paying bills will run up nice big debts on their cards. Let’s for once try to NOT live up to others' expectations. It’s alright, even good for your credit, to have more than one card, but try to keep it under five. Further, more important than how many is how much. Try to keep track of every charge you make. Obviously, it’s best to pay off the balance in full, but at the very least make absolutely sure to pay off the minimum balance due. Don’t incur a late penalty by waiting for that birthday check so that you can pay the whole thing. First pay the minimum, then pay the rest when the check clears. Generally, you want to owe no more than 35% of your available balance. Easy math: if they give you $5,000 credit you want to keep the total balance owed each month down to $1,750 or less. 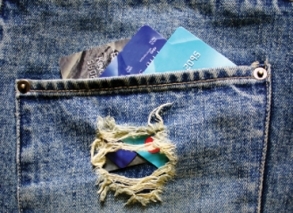 Read more about Picking the Right Credit Card. Rare late payments will likely not affect a credit score drastically, but repeat offenses can (see “Know what affects a credit score” above). Ask the companies to change payment due dates. Coordinating due dates for all of your bills makes it much easier to pay them off. Pay bills the same day they come in the mail. There’s no sense in risking a late payment. If the money’s there, pay it immediately to make sure it’s still there when the bill is actually due. Go paperless. Manage your credit card online and get e-mail alerts when your bill is due, and you can set up a "Direct Pay" option that let you handle the bill with the click of a mouse. If you often forget about bills, you can sign up for automatic bill pay with your bank, but be careful. Unlike a consistent bill like rent, your credit card bill is something you want to check closely every month, and you don't want to accidentally overdraw from your bank account to pay for it. Call the company to let them know if a bill must be paid late. Companies appreciate proactive customers, and most understand that everybody makes mistakes now and again. Find even more advice here. Unfortunately, when it comes to credit, the stats for our age group do not look good. In the last 15 years, the average credit card debt we carry after graduating has climbed to about $2,623. Throw in all the student loans we’ve been taking out lately, and “bleak” doesn’t even begin to describe the picture. The more available credit you have, the better. Spreading a large balance over two or more cards with lower interest rates looks better to credit bureaus. Compare cards at CardRatings.com. Contact a bank or credit union about debt consolidation through a fixed rate loan. Debt consolidation means you’re agreeing to pay the full amount that you owe over a specified period of time at a fixed interest rate. Under a debt consolidation plan, a bank grants you a loan to cover all of your debt, and you agree to pay back the bank with a fixed monthly payment over a specific amount of time, such as five years. Fixed payment plans like this look great to credit bureaus, because it shows that a bank has faith that you’ll pay them back consistently. Check out our article Student Debt Consolidation and Forgiveness for more help. Avoid it at all costs. Filing for bankruptcy pardons you from paying off debt. But it completely screws you for seven years, making loans and credit cards virtually impossible to obtain— especially in the first two or three years. It’s a blemish as nasty as Kelly Kapowski’s on the Saved By the Bell prom episode.